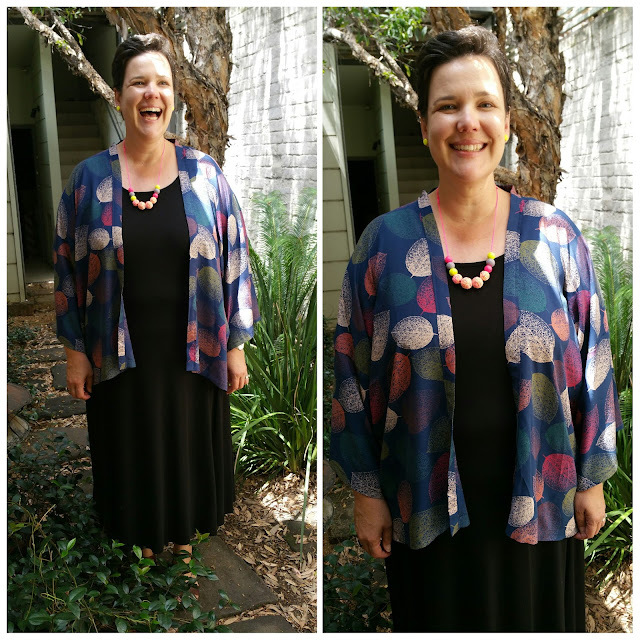 I made this kimono is a class at Sew Make Create - the class ran for 6 hours over two Saturday's and I'm super happy that I actually finished it (with a bit of sewing in between the two classes). I wanted to take this class so that I had some hand holding sewing a fabric that has gotten the better of me in the past...rayon! The pattern is essentially a bunch of rectangles joined together with a lot of French Seams thrown in. 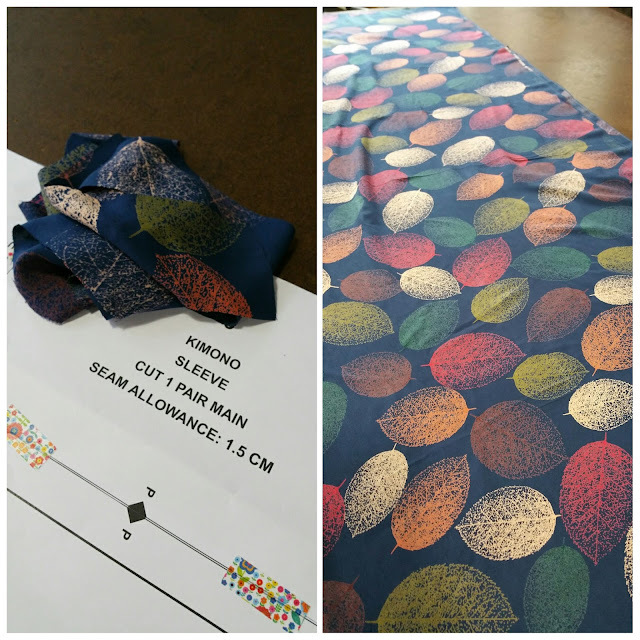 The pattern is drafted by the sewing teacher, Angie, and comes with an order of construction but no step-by-step instructions SO if I'm going to make another Kimono (which I am) I'll need to buy a pattern as I'm already forgetting how this got put together. I'm thinking the Papercut Kochi Kimono as it's pretty similar in shape to this one. The fabric is a rayon that I bought from the markets in Ho Chi Minh last year. I bought it (along with another piece) as it was pretty but with no idea what I'd do with it (especially as I really do not ever sew with woven fabric). 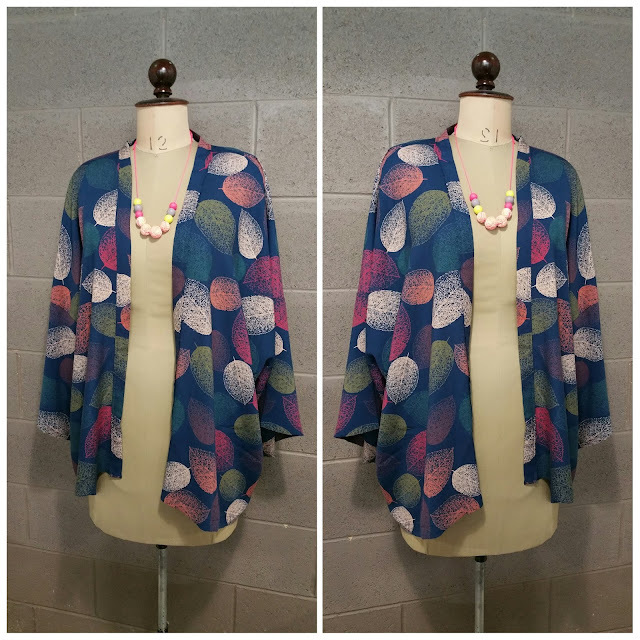 When I tried the shop sample on in Sew Make Create I knew that this soft, floaty rayon would be perfect for a kimono. The fabric was actually fairly easy to sew with it (which I wasn't expecting) - it held a press REALLY well which made things easier. It's not as stable as cotton so it was a bit fiddly in places but I didn't really struggle as much as I thought I would. The main problem I had with it was when cutting out - it's fairly fluid and moves around so I guess it's fabric that use for a more loose, flowy garment where it does not really matter too much if things are a bit wonky when you cut them out. I'm really happy with my finished Kimono (so happy that I wore it straight away and got Melissa and Pepper from Sew Make Create to take some photos for me)! 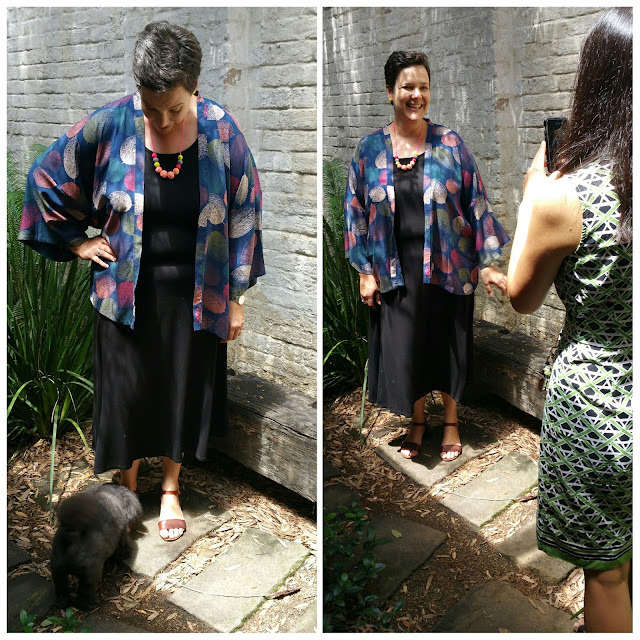 One of the big reasons I decided to sew the Kimono in this fabric is that I thought it would make a GREAT layering piece for my trip to Cambodia next month...it will definitely be coming in my suitcase with me.